We may have bad news: the brand-new reboot of the Tomb Raider franchise, for the second time (after the original) called Tomb Raider, is coming 5 March 2012, but we have got another trailer called Crossroads, watch it now on Tomb Raider's official YouTube channel and check out our site here for latest info! 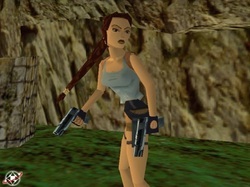 Watch all Tomb Raider I cutscenes on our site! you will find all cutscenes of Tomb Raider starring Lara Croft, and enemies between whom, Natla, also great scenes, explenations and exotic places, you can go to the page by clicking here! Check the great site of Katie and her award winning stories! You can touch the new sense of Lara once again Tomb Raiders! 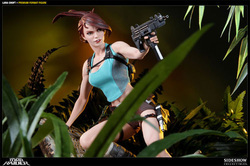 Slideshow previewed the new figure of Lara Croft in the costume from the game Lara Croft and the Guardian of Light, available since June 2! Tomb Raider (2011) nominated for E3 awards! The channel on YouTube and new production "Tomb Raider Universe" is set to release a movie featured with all cut-scenes and game-plays off the first game from Tomb Raider, back from the 1996! It will be released in parts on YouTube and also on CD with special cover and designs!